Hong Yang is originally from Beijing, China where she studied dance at the school of the Beijing Dance Academy graduating in 1995. She joined the National Ballet of China and was a principal dancer there before going to Toronto, Canada where she danced with Ballet Jörgen Canada. 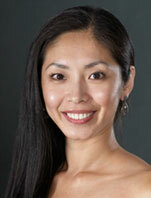 In 2002 she joined Carolina Ballet as a soloist. Ms Yang’s repertoire is extensive. Along with being featured in many ballets by Robert Weiss, she performed choreography by George Balanchine including, Apollo, Allegro Brilliante, Concerto Barocco and The Four Temperaments; Lynn Taylor Corbett including Carmina Burana, Great Galloping Gottschaulk, and Carolina Jamboree, and Jose Limon including Moor’s Pavane. She also performed works by Dameon Woetzel, Christopher Wheeldon and Tyler Walters. She retired in 2011 with a performance of Tatiana in Balanchine’s A Midsummer’s Night’s Dream. Since then she has been passing on her knowledge and love of dance through teaching.